Indian spinach. This is most likely to be Basella alba, a tropical climbing plant that can grow as high as 2 meters (6 ft), the leaves being harvested as the plant grows and cooked in the same way as spinach or stewed in oil with spices. 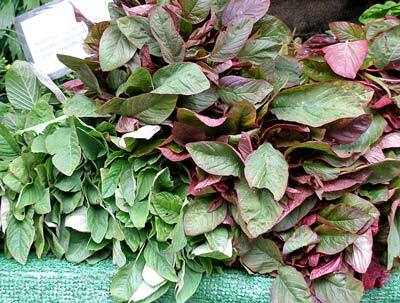 It is a type of amaranth, which includes many varieties of a sweetish green leafy vegetable known by many different names, including callalloo, elephant’s ear, African/Ceylon/ Chinese/Indian spinach, Surinam amaranth, etc.